Because of limitations of 2 and 3, it may be best to stick with 3.5 SP2 for now. 4.0 seems more linked to Web projects for the minute. Visual Studio Tools for SQL Server Compact 4.0. Unable to find microsoft site but link from here works. 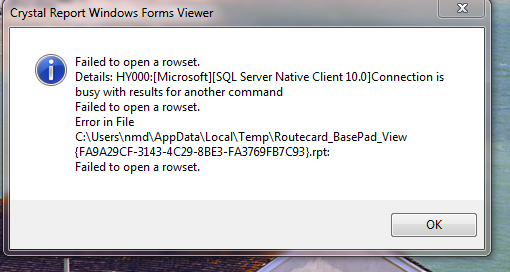 This seems to be because I created the “Visual Studio > Team Explorer > New Team Project ” before setting up TFS reporting. (Initially tried to resolve this by finding the Compressed Zip file with the standard reports in. Then uploading the reports into Report Server one by one. Bug Status report uploaded send the “Warning” parameter was missing a value. STILL NOT WORKING. Getting Closer I Feel. In SQL I added a column to a table and initially had the column as Not Nullable. I then updated a view to use the new column. I then updated Entity Framework model from the database. I then changed my mind and made the column nullable. I then updated EF model once again and it would not compile. No-manner of updating column Nullable properties worked. After some reading suggested this was a bug in EF. As a precaution I updated the view in SQL to refresh the schema went to EF and removed and added it again. Problem on a colleagues machine where ODBC was very slow on Crystal Reports. However problem was that ODBC > Tracing > Tracing was on. Stopped it and crystal reports immediately went quicker. The log file was also very big 200,000 Kb.